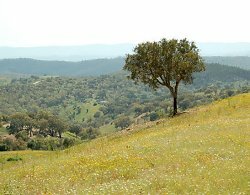 Recently one of our team went to the Alentejo which is north of the Algarve in rural Portugal and was surprised to learn just how much medieval history there is there - from medieval villages and towns to medieval castles. As chance would have it, they were there on 25 April which is "Revolution Day" in Portugal, celebrating the Carnation Revolution. There are festas and parties in every town throughout Portugal that weekend and our team member managed to get to Almodovar where there was a rather special 'party' taking place. The first photograph he took on the way there and shows the magnificent, unspoiled countryside that stretches for miles into the distance. The second photograph he took in Almodovar itself where they were making preparations for a medieval fair of some kind. 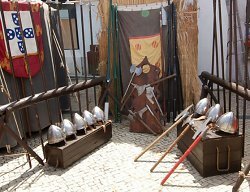 The heraldry, helmets and axes in the photograph are replicas of what would have been used in medieval Portugal. It's interesting to note that Portugal’s medieval castles, like the majority of those built in England and Scotland, were built for defence purposes - primarly against Spanish kingdoms to the north and hostile Moors to the south. They were certainly effective and it is said that Portugal today has the longest standing border in Europe. Our team member was so taken by the lakeside quinta retreat which he used as his base, that he suggested we pass on the recommendation. Called 'Paradise In Portugal' it enjoys a unique, tranquil, lakeside setting and friendly atmosphere - a great base for a central Portugal holiday. It certainly looks a stunning place!